For most of the world’s population, bank notes are an everyday part of their lives, and few give a second glance at the notes in their pockets. For those of us who ardently collect bank notes as an activity, we admire and value them as part of an amassed collection. In my case, I routinely write about bank notes as part of my activities, concentrating on the designs of these instruments of currency which take on a very different meaning to the countries these bank notes are issued from. Bank notes and coins often carry the task of ambassador for their respective countries when taken outside their borders, and governments are well aware of this. Our notes, for the most part, carry messages of strength, artistry, culture, financial and political stability, and national pride, as well as honouring personalities living and passed. This is done to great effect most of the time. However, one talented artist has concentrated on the framework of bank notes to use in his own artwork, and has done so admirably. 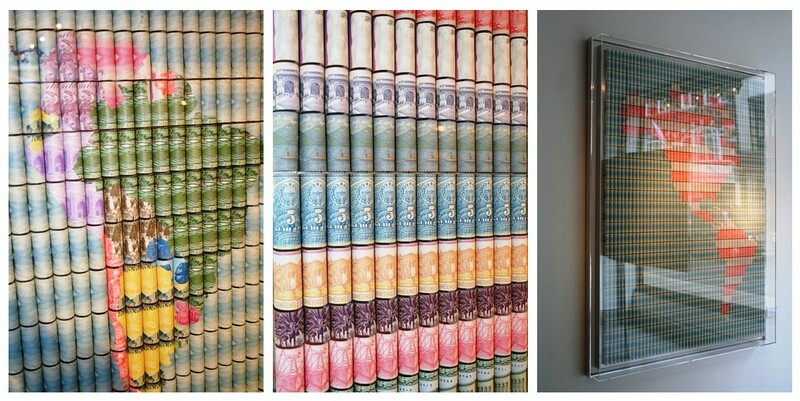 Contemporary artist Santiago Montoya has taken the use of bank notes in art to a new level. 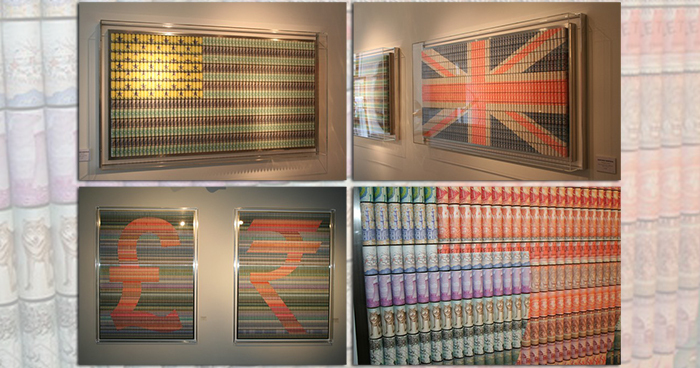 Utilising their colour, design, and patterns, he has created larger designs and familiar motifs using elements of specific bank notes. As a collector of bank notes, what immediately catches your eye are the more familiar ones. Yet in addition to those U.S. dollars and Chinese renminbi are the more obscure (and sometimes long-ago) notes issued in such countries as North Korea, Brasil, Cuba, Indonesia, or Latvia. Part of the joy of viewing these pieces from the standpoint of a bank-note enthusiast is being able to identify the many notes used in a particular display or work. Montoya’s eye is very keen in regard to using a specific note to achieve the most effective outcome, especially for a composite of a more familiar image, and this is most apparent with his creation of world maps. The results—derived from the manipulation of the notes, their repeated “re-contextualising,” the amassing together of notes of a particular colour, and the addition of the element of gradient colour shifts—form a unique and innovative concept. This conjures new images of many already familiar designs or sights, such as (but not limited to) flags, maps, or portraits. Montoya’s exhibition in London ran exclusively from the 9th January to the 12th February and included the works featured in this article—which are still on display. By using cliché titles and familiar imagery, Montoya sought to explore socio-political issues and complex subject matters with an element of humour, and in doing so, encourages conversation and debate. 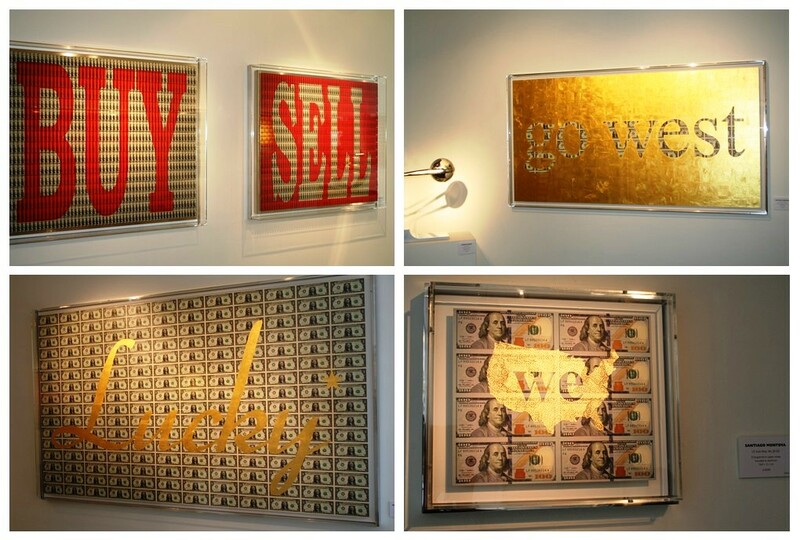 Santiago’s works will be featured at the Halcyon Gallery’s location at 29 New Bond Street until the 25th September. 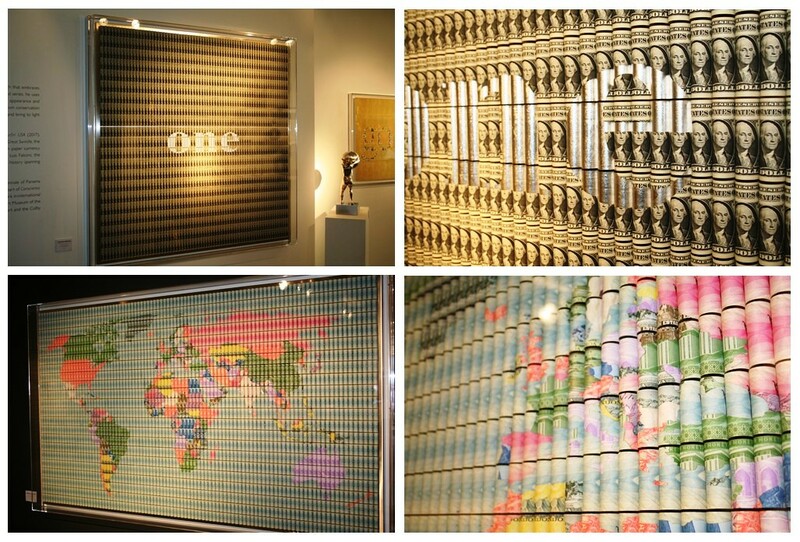 Thereafter, many pieces will be on show at their main location at 144–146 New Bond Street, lower ground floor. For those bank-note enthusiasts finding themselves in London, it would be prudent to make a point of stopping by to see this imaginative and engaging artistic concept. The pieces featured in this article are all available for purchase. I would like to extend my appreciation to Simon Quintero, senior curator for the Santiago Montoya Exhibition, for his kind assistance with this article. For additional information, please visit the Halcyon Gallery’s website.